The disruption of intercellular adhesions is an important component of the acquisition of invasive properties in epithelial malignancies. Alterations in the cell-cell adhesion complex, E-Cadherin/β-Catenin, have been implicated in the oncogenesis of carcinomas arising from various anatomic sites and have been correlated with adverse clinico-pathologic parameters. 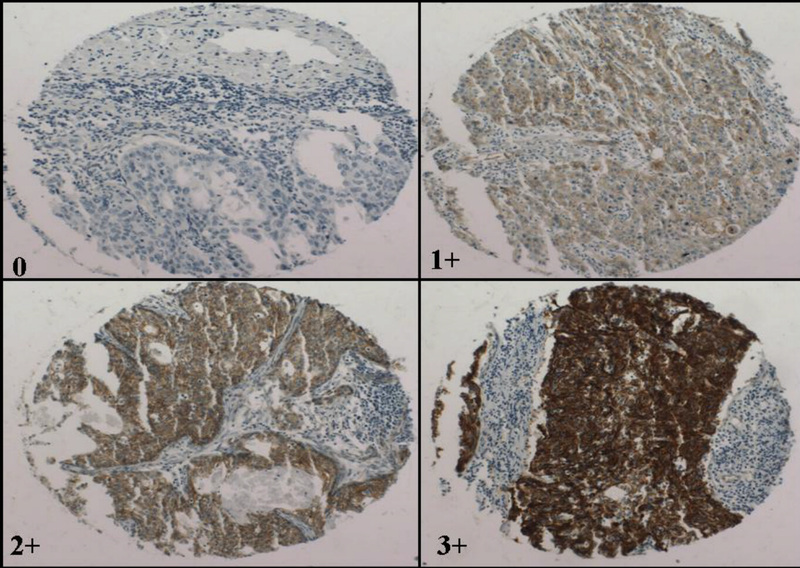 In this study, the authors investigated the immunohistochemical expression of E-Cadherin and β-Catenin in a cohort of early stage cervical cancers to determine its prognostic significance and to investigate differences between the three major histological subtypes. A tissue microarray of 147 cases of FIGO stage 1A and 1B cervical carcinomas [96 squamous cell carcinomas (SCC), 35 adenocarcinomas (AC), 12 adenosquamous carcinomas (ASQ), 4 miscellaneous types] was constructed from our archived surgical pathology files and stained with monoclonal antibodies to E-Cadherin and β-Catenin. Cases were scored by multiplying the intensity of staining (1 to 3 scale) by the percentage of cells stained (0–100%) for a potential maximum score of 300. For both markers, "preserved" expression was defined as bright membranous staining with a score of 200 or above. "Impaired" expression included any of the following: negative staining, a score less than 200, or exclusively cytoplasmic or nuclear delocalization. Impairment of E-Cadherin and β-Catenin expression is very frequent in early stage cervical cancers, and alterations in the E-Cadherin/β-Catenin cell adhesion complex are therefore likely involved in the pathogenesis of cervical carcinomas even at their earliest stages. None of the three major histological subtypes of cervical carcinoma (SCC, ADCA, ADSQ) is significantly more likely than the others to show impairment in E-Cadherin and β-Catenin expression. Overall, the expression of both markers does not significantly correlate with clinico-pathological parameters of prognostic significance. The resounding success of the routine papanicolaou smear in reducing the incidence and mortality of cervical cancer has been chronicled extensively [1–6]. However, epidemiological data from 2004 indicates that 10,520 new cases of invasive cervical cancer are still diagnosed annually in the United States, with an associated mortality rate of approximately 37% . For those patients with early stage (FIGO stage I and II) cervical cancers treated primarily with surgical therapy, the decision to administer adjuvant therapy is dependent on a variety of clinical and histopathological parameters. The latter includes the presence or absence of lymphovascular, or deep stromal invasion, large tumor size, tumor involvement of resection margins, involvement of regional lymph nodes etc . Although histopathological parameters classify these patients into broad groups – each comprised of patients with similar risk-profiles for recurrence, the groupings are inherently non-specific . Therefore, it is anticipated that some patients with cervical cancer receive unnecessary adjuvant therapy, with their attendant toxicities. It would thus be of interest to identify biomarkers which can be evaluated on the primary tumor and may further help refine the subset of patients at the most significant risk for recurrence and thus in need of intensive adjuvant management. The disruption of intercellular adhesions is an important component of the acquisition of invasive properties in epithelial malignancies. Alterations in the cell-cell adhesion complex, E-Cadherin/β-Catenin, have been implicated in the oncogenesis of carcinomas arising from various anatomic sites and have been correlated with adverse clinico-pathological parameters [10–22]. Epithelial Cadherin (E-Cadherin) is a 120 kDa transmembrane glycoprotein which is involved in both homotypic and heterotypic Ca2+-dependent cellular adhesions [23–26]. Inactivation of E-Cadherin may occur through mutations, methylations or deletions of the E-cadherin gene, suppression of the E-Cadherin gene promoter, or posttranslational modification of the protein leading to cytoplasmic delocalization [27–30]. The strength of E-Cadherin-mediated intercellular adhesion is significantly increased by interactions between the cytoplasmic tail of E-cadherin and the cytoskeletal network . This interaction is mediated through the cytoplasmic proteins β-Catenin, α-Catenin and γ-Catenin [23–26]. β-Catenin is a 92 kDa protein that, in addition to its cell-adhesion properties, alsoplays a role as a transcriptional co-activator in the Wnt signaling pathway; the latter is involved in cellular development, differentiation and oncogenesis [32, 33]. Deregulation of the Wnt pathway may occur through an activating mutation of the β-Catenin gene, leading to accumulated levels of β-Catenin in the cytoplasm and nucleus, and culminating in the altered transcription of a variety of critical genes . The cervix, in which a dysplasia-to-carcinoma sequence is well-established, offers a useful medium to comparatively study the expression of proteins involved in cell-to-cell adhesion in dysplastic and invasive epithelium. 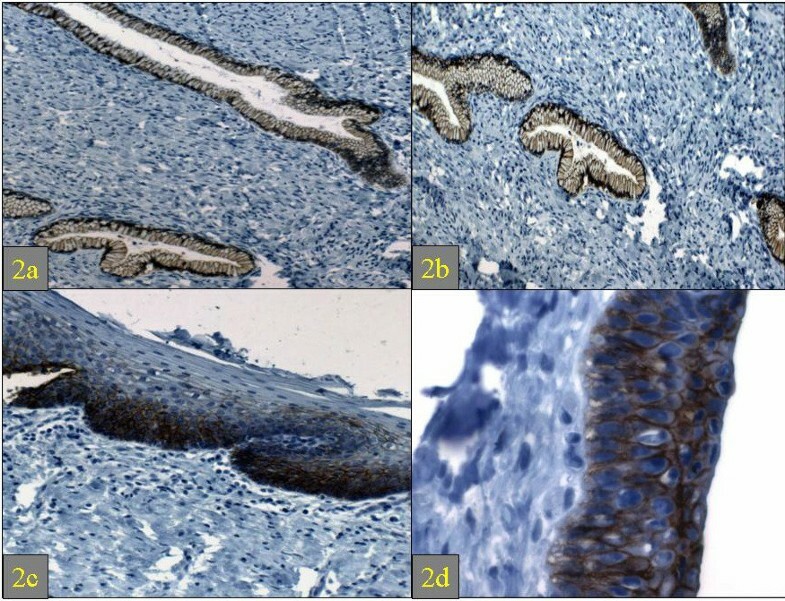 Previous studies have shown that the expression of E-Cadherin and β-Catenin, as evaluated immunohistochemically, is inversely proportional to the histologic grade in squamous intraepithelial lesions (SIL) of the cervix: expression of both markers is generally maintained in low-grade lesions and is lost in high grade lesions [34–36]. In the present study, the expression of E-Cadherin and β-Catenin was evaluated on a cohort of already invasive, albeit early stage cervical carcinomas. Our objectives are 1) to determine the frequency of loss of expression of E-Cadherin and β-Catenin in early stage cervical carcinomas 2) to determine whether the expression of either of these biomarkers is of prognostic significance 3) to specifically investigate whether there are any differences between the three major histological subtypes of cervical carcinoma with respect to expression of E-Cadherin and β-Catenin. Following approval from our institutional review board, a tissue microarray (TMA)  of 147 cases of international federation of gynecology and obstetrics (FIGO) stage 1a and 1b cervical carcinomas was constructed. Technical details on microarray construction at the Yale tissue microarray facility are outlined elsewhere [38, 39]. The cases were retrieved from the archived surgical pathology files at Yale New Haven Hospital and consisted of carcinomas diagnosed between 1987 and 2001. These cases were not consecutive but were selected on the basis of availability of at least one evaluable tumor-representative hematoxylin and eosin-stained slide and a paraffin block. On each case, slides were reviewed to select a representative tumor spot. The corresponding spot on the associated paraffin block was then cored and placed on a tissue microarrayer (Beecher Instruments, Silver Spring, MD, USA). The microarray was constructed with a 2-fold redundancy (2 spots for each patient), which has been previously shown by Camp et al  to accurately represent standard tissue sections in at least 95% of cases. The finalized arrays were then cut into 5 μm-thick sections and mounted on glass slides using an adhesive tape-transfer system (Instrumedics Inc., Hackensack, NJ, USA) with ultraviolet cross-linking. To evaluate the staining patterns of E-Cadherin and β-Catenin in the normal cervix, 5 such cases were retrieved from our database. These 5 cases were hysterectomies performed for adnexal masses in which the final diagnoses were non-neoplastic (endometriosis [n = 4], tubo-ovarian abscess [n = 1]), Sections from the cervix in these cases were then stained with monoclonal antibodies to E-Cadherin and β-Catenin. The tissue microarray slides were stained with antibodies to E-Cadherin (Clone NCH-38, dilution 1:100, DakoCytomation Corporation, Carpinteria, CA, USA) and β-Catenin (Clone 17C2, dilution 1:100, NovoCastra Laboratories Ltd., Tyne, UK) using a DAKO autostainer based on the standard avidin-biotin complex method. Tissue microarray slides were deparaffinized with xylene and graded alcohols then rehydrated with distilled water. Endogenous peroxidase activity was blocked by placing the slides in 0.5% hydrogen peroxidase/methanol for 10 minutes followed by a tap water rinse. Background staining was reduced by incubating slides in 0.3% bovine serum albumin/Tris-buffered saline. Antigen retrieval entailed placing the slides in a pressure cooker with an antigen unmasking solution (0.01M citrate buffer, pH 6.0) for 1 minute. Slides were subsequently incubated with the primary (4°C overnight), then biotinylated secondary antibodies and streptavidin-biotin peroxidase. 0.05% 3'3' diaminobenzidine (DAB) was used as chromogen, followed by counterstaining with hematoxylin. Since both E-Cadherin and β-Catenin are normally expressed in a bright membranous fashion in the cervical epithelium, aberrations on this basic theme were deemed abnormal for the purposes of this study. Thus, cytoplasmic staining, nuclear staining and no staining were considered "impaired" expression. Cases were scored by multiplying the intensity of staining (1 to 3 scale, see figure 1) by the percentage of cells stained (0–100%) for a potential maximum score of 300. For both markers, "preserved" expression was defined as bright membranous staining with a score of 200 or above. "Impaired" expression included any of the following: negative staining, a score less than 200, or exclusively cytoplasmic and/or nuclear delocalization. Only the core showing the highest score was utilized in each case. In 144 of 147 cases, the scores did not differ between the 2 cores on each case by more than 50 points. None of the 3 cases with such a discrepancy (i.e. differences of more than 100 points between the 2 cores) affected the "impaired" versus "preserved" expression distinction, because all 3 cases showed impaired expression in both cores. The microarrays were scored by 2 independent observers (OF and DH). Discrepancies were resolved at a consensus session. Results were then correlated with a variety of pathologic parameters, including tumor size, frequency of lymphovascular invasion, lymph node involvement and histological grade. Representative cores illustrating the criteria used for scoring staining intensity (β-Catenin is shown; E-Cadherin was similar, although with an overall lower intensity). For comparison of cases showing impaired versus preserved expression with respect to various clinico-pathological parameters, two-sided likelihood ratio chi-square test or Fisher's exact tests were used with p < 0.05 as the "statistically significant" cut-off point. Survival analysis was carried out by Kaplan-Meier method and Wilcoxon test was used to compare survival. Spearman correlation coefficients were calculated to examine the correlations between the two markers. All analyses were performed using SAS version 9.0 (SAS Institute, NC). To externally validate the staining patterns observed on the microarray, 14 cases representing approximately 10% of the array were selected in a semi-random fashion using a randomization function (Microsoft Excel®, Microsoft Inc, Redmond, WA, USA) on a list of the entire cohort. The goal was to obtain a representative mix of cases with negative and positive stainings (4 groups, each consisting of 3 cases with a score of 0, 1–99, 100–199, 200–300; 2 additional cases for the last group). Thus, each case selected from the list by the randomization function was included in the validation list consecutively until the preset quantitative requirement for that group was met. On each of these 14 cases, a full representative tissue section was then stained with E-Cadherin and β-Catenin and scored using the same system used with the microarray. The staining patterns of E-Cadherin and β-Catenin were identical. However, β-Catenin staining was generally of greater intensity than E-Cadherin staining. In the endocervices of all 5 cases, both markers brightly decorated the epithelium in a circumferentially membranous fashion (basolateral and glycocalyceal). No cytoplasmic or nuclear staining was noted (Figures 2a and 2b). In the ectocervix, staining was also membranous but was limited to the lower two-thirds in 4 cases and the lower half in 1 case (Figure 2c). Squamous metaplastic epithelium was present in 3 cases, all of which showed transmural bright membranous staining (Figure 2d). In all 5 cases, the basal and parabasal cells displayed the greatest intensity of staining (3/3). There was no stromal staining. Expression of E-Cadherin in the normal endocervix (2a, hematoxylin and eosin, original magnification ×100; 2b: hematoxylin and eosin, original magnification ×200), ectocervix (2c: hematoxylin and eosin, original magnification ×100) and squamous metaplastic epithelium at the transformation zone (2d) (hematoxylin and eosin, original magnification ×200). The 147 cases consisted of 96 squamous cell carcinomas (SCC), 35 adenocarcinomas (ADCA), 12 adenosquamous carcinomas (ADSQ) and a heterogeneous group of 4 cases hereafter referred to as "others". The latter group included 1 small cell carcinoma, 1 pure large cell neuroendocrine carcinoma, 1 squamotransitional carcinoma and 1 adenosquamous carcinoma with morphologically-evident neuroendocrine differentiation. 4 cases were deemed unsatisfactory during scoring by virtue of poor tissue preservation on the microarray slides. The clinicopathological characteristics of the cohort are outlined in table 1. Impaired expression of β-Catenin was present in 107 (75%) of the 143 cases and in the majority of all the histological subtypes. ADCA had the highest percentage of impaired beta-catenin expression (85.7%, 30/35). Compared to ADCA, a smaller proportion of cases of SCC showed impaired beta-catenin expression (66.7%, 64/96). However, the difference was not significant (p = 0.06). ADSQ showed an even lower proportion of cases with impaired beta-catenin expression (58.3%, 7/12). Compared to ADCA, the difference was not significant (p = 0.06). The difference between SCC and ADSQ was also not significant (p = 0.47). Impairment of expression was most commonly in the form of absent staining (79/107); 19 cases did not meet out quantitative criteria for positivity while 5 cases showed exclusively cytoplasmic delocalization. There were no cases of exclusively nuclear staining (Table 2). The mean age for the patients with preserved and impaired β-Catenin expression was 41.5 years (± 10.6) (n = 39) and 41.6 years (± 11.5) (n = 104) respectively. There was no significant difference (p = 0.99) between these 2 groups. Similarly, there were no statistically significant differences with respect to recurrence free survival (Figure 3), overall survival (Figure 4), frequency of lymphovascular invasion, histologic grade, and frequency of lymph node involvement (Table 3) when cases with impaired expression of β-Catenin were compared with those in which β-Catenin was preserved. 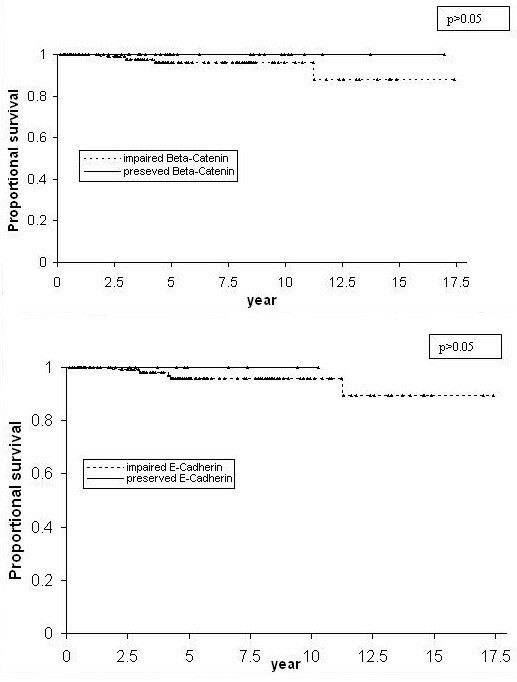 Kaplan-Meier recurrence-free survival curves comparing patients whose cervical carcinomas showed preserved expression of E-Cadherin and β-Catenin to those with impaired expression (▲ indicates censored observations). Kaplan-Meier overall survival curves comparing patients whose cervical carcinomas showed preserved expression of E-Cadherin and β-Catenin to those with impaired expression (▲ indicates censored observations). Of the 143 cases, 134 (94%) showed impaired expression of E-Cadherin. Notably, impaired expression of E-Cadherin was present in 100% of the 12 ADSQ; however, high frequencies of impaired expression were also present in ADCA and SCC and the differences between the histologic subtypes were not statistically significant. Impairment of expression was most commonly in the form of absent staining (99/134); 24 cases did not meet out quantitative criteria for positivity while 8 cases showed exclusively cytoplasmic delocalization. No case showed nuclear staining (Table 2). The mean age for the patients with preserved and impaired E-Cadherin expression was 36.5 years (± 9.1) (n = 12) and 42.4 years (± 11.7) (n = 131) respectively. Thus, patients with impaired E-Cadherin expression appeared to be older than patients with preserved E-Cadherin expression. However, the difference was not statistically significant (p = 0.09). 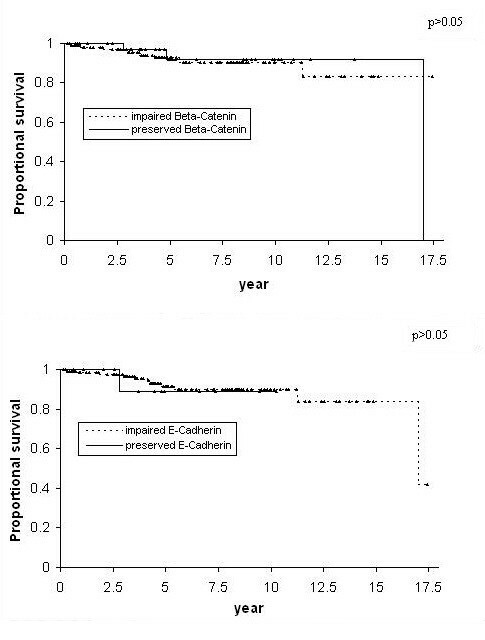 As with β-Catenin, there were no statistically significant differences with respect to recurrence free survival (Figure 3), overall survival (Figure 4), frequency of lymphovascular invasion, lymph node involvement and histologic grade (Table 3) when cases with impaired expression of E-Cadherin were compared with those in which E-Cadherin was preserved. In 13 of 14 cases, the scores obtained on standard histologic sections were within 50 points of the scores obtained on the corresponding tissue microarray spot (average difference: 30). In the 14th case, the tissue microarray spot was scored 0 whereas the corresponding histologic section was scored 100. In none of the 14 cases did a score discrepancy affect the "preserved" versus "impaired" distinction. In this study, we demonstrate that 1) loss of expression of both E-Cadherin and β-Catenin are frequent events in early stage cervical carcinomas of all three major histological subtypes, and both proteins are thus likely participants in the pathogenesis of cervical carcinoma, 2) Loss of expression of both proteins is of no prognostic significance with respect to the following parameters: recurrence free survival, overall survival, frequency of lymphovascular invasion, histologic grade, and frequency of lymph node involvement. Our findings are in concordance with the recent study of Van de Putte et al , in which cases of stage 1B SCC were analyzed. In that study, loss of expression of E-Cadherin and β-Catenin in greater than 50% of tumor cells was found in 90% and 72% of cases respectively. However, the authors found no correlation between the expression of E-Cadherin and β-Catenin (and other catenins) and prognosis . In contrast, Jeffers et al  found strong expression of E-Cadherin in all 20 cases of invasive cervical carcinoma that were studied. However, those 20 cases were an admixture of all stages and the prognostic significance of E-Cadherin was not specifically investigated since all cases were positive. Other studies have also showed a high frequency of loss of E-Cadherin expression in cervical cancers. Applying the criteria of the present study, impaired expression of E-cadherin was found in 89% of invasive SCCs in one study . In the study of Sun et al , 60 cases of invasive cervical carcinoma of all stages were investigated for E-cadherin expression. Loss of expression of E-Cadherin was found in 53.3% of cases. Additionally, the authors found a correlation between abnormal E-Cadherin expression and clinical stage and, in contrast to the present study, lymph node involvement and histologic grade. Similarly, among all stages of cervical adenocarcinoma, abnormal expression of β-Catenin was significantly associated with advanced pathologic stage and thus disease-free survival in another study . In the latter two studies, the noted discrepancies with the current one may be related to qualitative technical differences (antibody concentration, antigen retrieval methods etc) or differences in interpretation (i.e. criteria for positivity). None of the above studies have specifically compared the 3 major histologic subtypes in early stage cervical carcinoma. However, the majority of studies show that loss of expression of E-Cadherin and β-Catenin is frequent in cervical carcinomas. Although their impact on prognosis of this expression is less certain, our study finds that the expression of both E-Cadherin and β-Catenin lacks prognostic significance at least in early stage cervical carcinoma. An orderly, membranous expression of E-Cadherin and β-Catenin is found in the normal cervix. The loss of expression of both proteins in a high proportion of high-grade squamous intraepithelial lesions [34–36] suggests that dysregulation of this pathway is an early event in cervical carcinogenesis. We investigated cytoplasmic and nuclear staining as a manifestation of impaired expression of both E-Cadherin and β-Catenin . In the typical normal cell β-Catenin's complex with E-Cadherin and the cytoskeletal network is inversely proportional to the association of β-Catenin with the adenomatous polyposis coli protein, a large multifunctional cytosolic protein. Thus, normally, only small portions of β-Catenin are found in the cytoplasm since the association of β-Catenin with APC eventuates in its lytic degradation. Cytoplasmic accumulation often leads to nuclear accumulation, where β-Catenin may interact with a variety of proteins, culminating in transcriptional activation of a variety of critical genes [23–26]. Experimental studies have shown that tyrosine phosphorylation of β-Catenin by oncogenic products or growth factor receptors may cause dissociation of the E-Cadherin-associated adhesion complex from the cytoskeleton resulting in cellular (non-membranous) redistribution and disassociation of adherens junctions, a well-known feature of epithelial malignancies [45, 46]. Exclusively cytoplasmic localization of β-Catenin and E-Cadherin, which was not present in any of the normal cervix epithelia, was seen in 3.4% and 5.4% of our carcinoma cases respectively. A progressive increase in the proportion of cases showing this finding was found in low grade SIL, high grade SIL and invasive carcinomas in one study . However, the logical extension of that finding, a correlation with histological grade in invasive carcinomas, was not found in this study. Our study is also in concordance with that of Shinohara et al , in which no relationship was found between the frequency of cytoplasmic/nuclear localization of β-Catenin and histologic grade (no cases of nuclear localization β-Catenin was found in our study). The possibility that our findings may have been significantly affected by our methods cannot be entirely excluded. Tissue microarray technology as a high throughput modality has gained wide acceptance in pathology investigations and is used routinely [48–52]. Our TMA was constructed with a two-fold redundancy to minimize sampling errors . Furthermore, in our validation set which constituted approximately 10% of the TMA, no significant discrepancies were seen. Nonetheless, error introduced by tumor heterogeneity remains a possibility. Most notably, the minimization of errors from the redundant (2-fold) construction of our TMA presumes a similar degree of tumor heterogeneity between breast  and cervical cancer, which may be untrue. The importance of defining thresholds in any investigations reporting the loss of the immunohistochemical expression of a biomarker cannot be overemphasized. As previously noted, a threshold of 200 was used in this study because both E-Cadherin and β-Catenin are normally expressed in a membranous fashion in most of the cervical epithelium (scores 270–300 for the ectocervix and 300 for the endocervix). However, we performed separate statistical analyses when the threshold was lowered, i.e. when "impaired" expression included any of the following: negative staining, a score less than 99, or exclusively cytoplasmic and/or nuclear delocalization. The results on all previous analyses remained the same (p > 0.05), with 2 exceptions: 1) Overall, the expressions of E-Cadherin and β-Catenin became significantly correlated (spearman correlation coefficient r = 0.33, p = 0.0001). 2) 73% of LVI-negative carcinomas showed impaired β-Catenin expression, compared to 47% of LVI-positive carcinomas (p = 0.03). The significance of the latter finding is unclear, and it can be anticipated that changes in the threshold in either direction (lowering or raising) would result in at least one parameter attaining statistical significance with each change. In our opinion, for a marker that is normally expressed, a high threshold should be used for "loss" of expression, and 200/300 seems reasonable. In the present report we demonstrated that impairment of E-Cadherin and β-Catenin expression is very frequent in early stage cervical cancers. None of the three major histological subtypes of cervical carcinoma (SCC, ADCA, ADSQ) is significantly more likely than the others to show impairment in E-Cadherin and β-Catenin expression. Alterations in the E-Cadherin/β-Catenin cell adhesion complex are therefore likely involved in the pathogenesis of cervical carcinomas even at their earliest stages. However, the expression of both markers does not significantly correlate with clinicopathologic parameters of prognostic significance. WZ and PES conceived of, supervised, and sponsored the project. Both revised the manuscript.